A Railway Engineering Infrastructure Company approached us with a requirement for a Stores Facility as part of their yard set up. The Store was created by joining three 40ft high cube storage containers together side by side. Side personnel doors and powder coated, motorised roller shutters were installed in place of the original cargo doors. Shipping containers were specified as they provide a flexible facility that can be moved easily in the future if required. Our customer needed the facility to be 100% weather tight on delivery. Should they need to increase their stores facility in the future a second shipping container level can easily be added without taking up additional yard area. 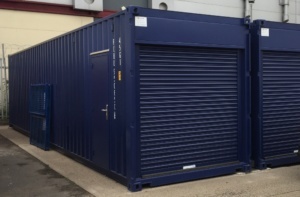 Our customer commented, “After enquiries to six container suppliers, we chose S Jones for the following reasons; S Jones were the only supplier who could provide the units as a weather tight facility on delivery, without the need for further site works. Their priced proposal included design drawings and photographs from similar projects, so we could see the product we would be getting. As an engineering company ourselves, we reviewed their design and could see that the details would work and were the result of tried and tested solutions from many years of experience. During the enquiry stage we were assured of their capabilities from the confident responses to our queries and questions. We were confident that they would be flexible and could provide a bespoke solution to our requirement and they could deliver to suit our timeframe. During the design and approval stage, all our comments and requirements were incorporated and we were given a full set of fabrication drawings prior to the start of manufacture, so we know what we would be getting. The facility was ‘on time’ and was manufactured and delivered in accordance with the date agreed and set down in our order. The units were delivered and the facility was set up and weather tight within 2 hrs of the first shipping container landing on site. The facility was manufactured in accordance with the approved drawings, and met our aspirations and expectations.